This time some chemistry for all the transition metal fans out there: a very nice synthesis of (+)-Roxaticin from Krische et al. 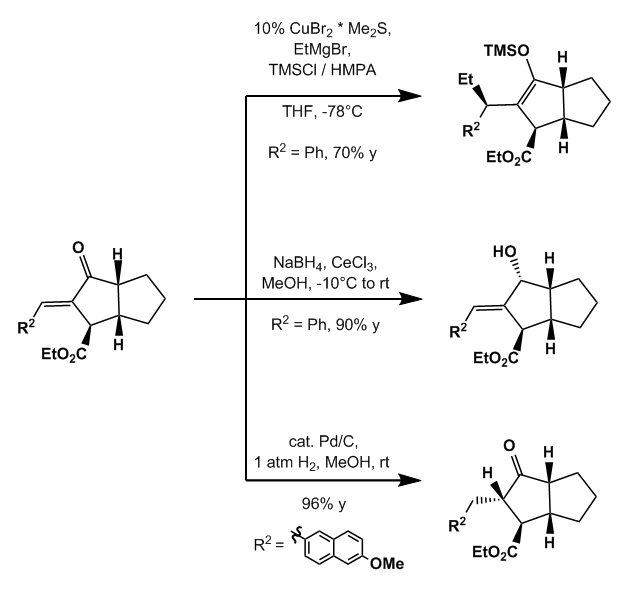 which demonstrates the outstanding potential of their stereoselective allylation chemistry. 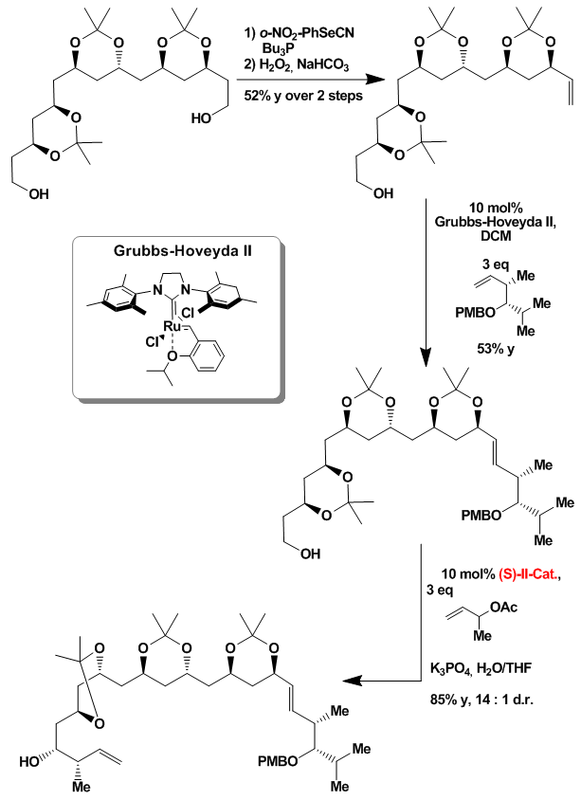 By employing the strategy developed by the Krische lab the otherwise painful synthesis of this beastie was extremely simplified. If you are interested in syntheses from other labs have a look in the supporting information of the original paper which contains an useful overview. Or if you are equally enthusiastic about the chemistry you should have a look in the paper which I linked above under additional information. The first one was synthesized by mixing [Ir(cod)Cl]2, the BIPHEP ligand, chloro-nitro-benzoic acid and the base in the presence of allyl acetate. 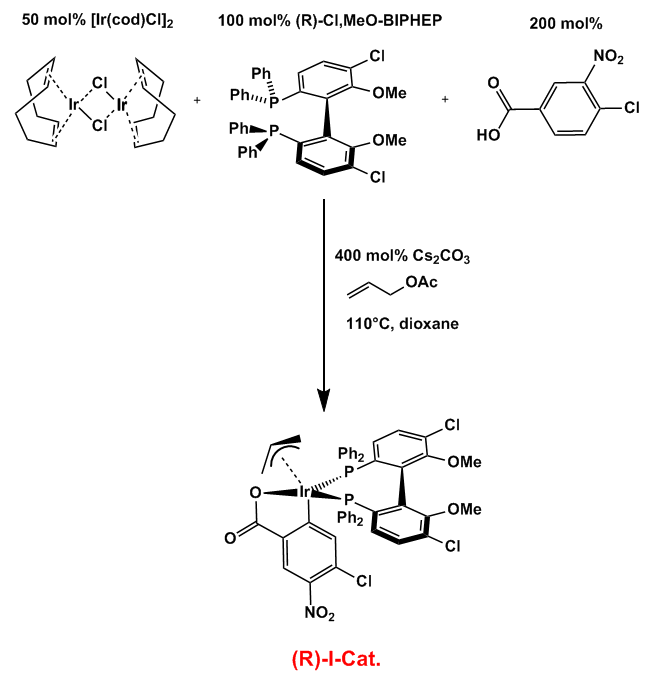 This in situ formed catalyst was used as such with remarkable results. As you will see in the ongoing synthesis the enantiomer of the (R)-I-Cat. was used, too. 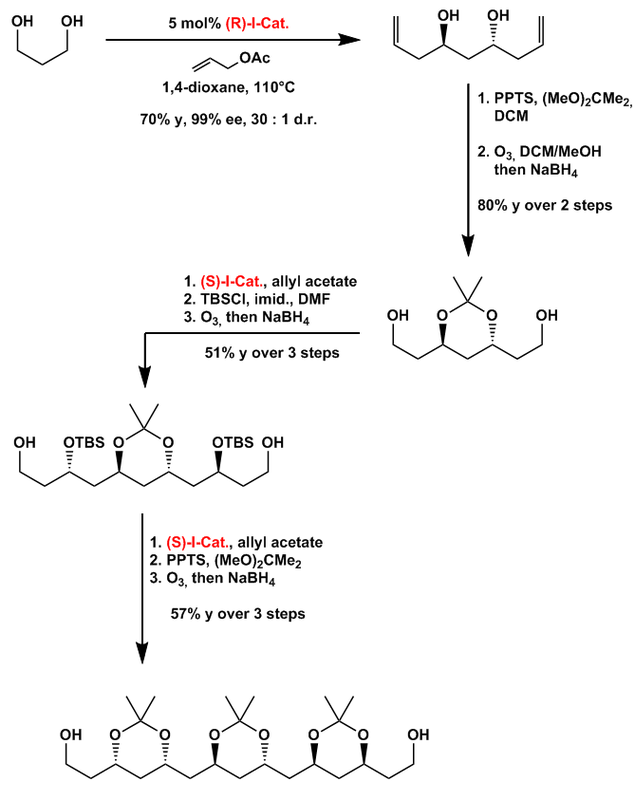 The synthesis begins with propanediol which was converted to the bishomoallyl alcohol under standard conditions in good yield and extremely high ee and dr. Protection as the acetonide was followed by ozonolysis and reductive work-up to give the next diol. This was again converted into the bishomoallyl alcohol, protected as the TBS ether and reacted with ozone/sodium borohydride to give another diol. 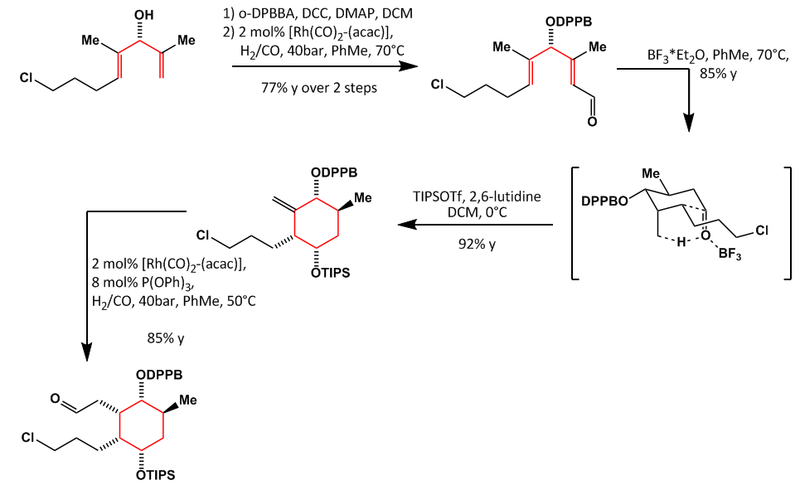 Allylation, conversion of the TBS ether into the acetonide and ozonolysis/reduction furnished the last diol. Next the C2-symmetric molecule was selectively converted on one side into the alkene by employing some Mukaiyama chemistry. First one alcohol was converted into a selenide which was oxidized and eliminated to give the terminal alkene in moderate yield. Olefin metathesis with the PMB protected homoallyl alcohol shown was followed by another allylation step of the remaining alcohol with methylallyl acetate. This time the second catalyst (S)-II was used and not less than two stereogenic centers were set up. Another olefin metathesis was employed again with Grubbs-Hoveyda-II but this time with acrolein as the chain extension. 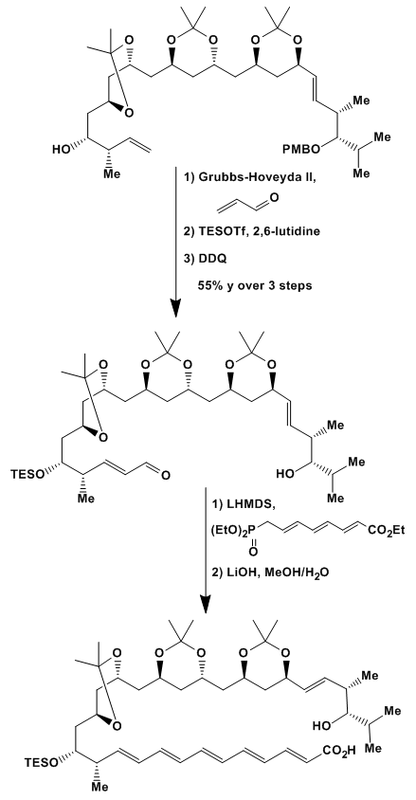 Protection of the free alcohol as the TES ether and oxidative PMB removal produced again a homoallyl alcohol. 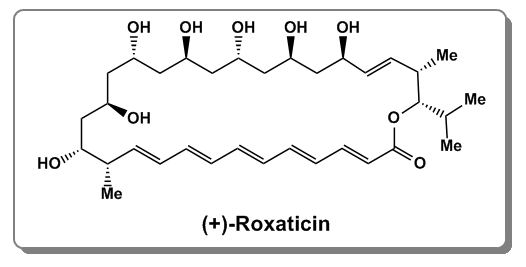 HWE-reaction of the terminal aldehyde and saponification of the ester then furnished protected (+)-Roxaticin in its open form. 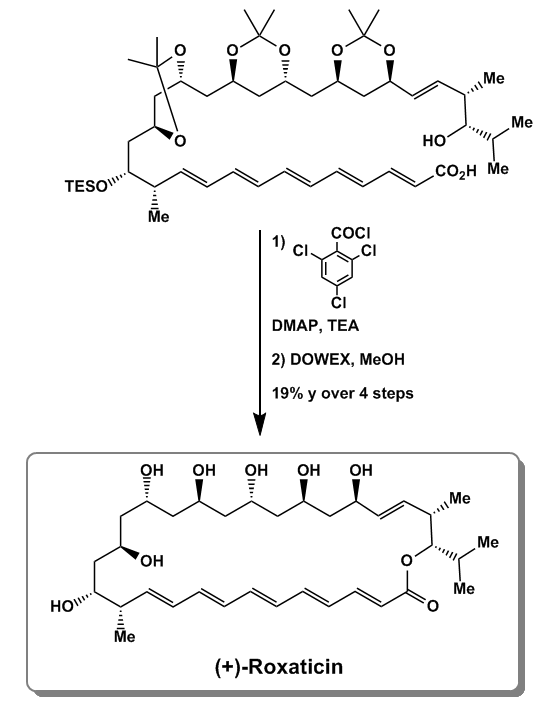 Yamaguchi ring macrolactonization and global deprotection with DOWEX-50 finished the synthesis in only 20 steps in the longest linear sequence. The in situ formed catalyst first oxidizes the alcohol to the aldehyde and forms a hydrido-iridium-species. It should be noted that the reaction can also be done with the aldehyde oxidation level but in this case they were too unstable to be used. Next fresh allyl acetate reacts with the reduced form of the catalyst to give again the allyl coordinated iridium which in turn inserts itself into the double bond an in situ formed aldehyde. By reacting with another molecule of alcohol the homoallyl alcohol was set free and the reaction cycle goes on. For clearance I skipped some intermediates but this should be sufficient to get a brief overview. I really like this sort of chemistry. Seems not applicable for multigram synthesis but for quick access to a lot of analogues it is the perfect method I think. 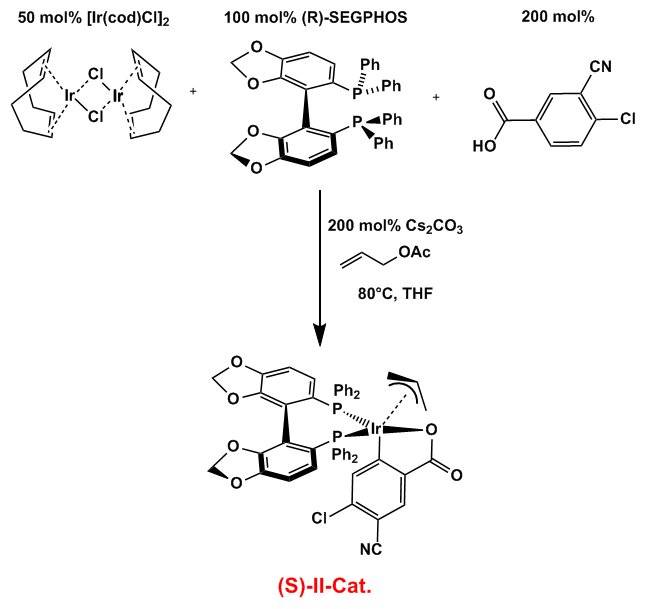 Syntheses of all 3 are rare and if published all except for one are racemic so an enantioselective approach might be useful for further biological evaluation. The synthesis starts right off with a simple alcohol which was oxidized and elongated using Swern- and Wittig-chemistry. Saponification, acid chloride formation and alkynone formation was followed by CBS reduction of the ketone moiety. 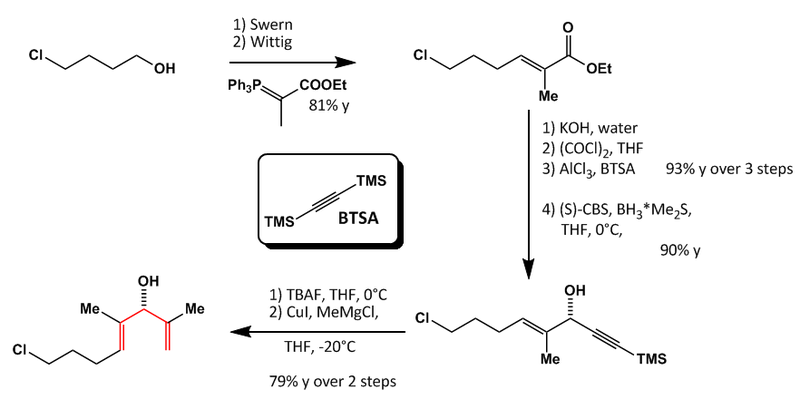 Next the TMS was cleaved with TBAF and the propargylic alcohol transformed into an allylic one by addition of a Normant cuprate (Cuprate addition of propargylic alcohols). 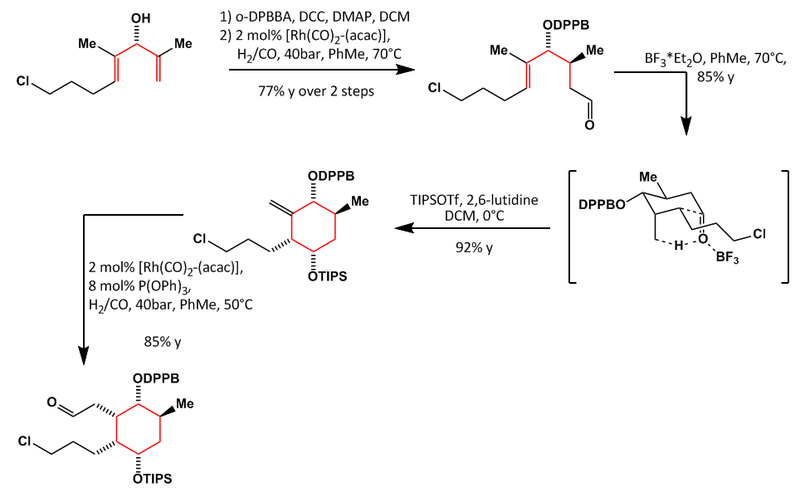 Esterification with DPPBA was followed by the first of two hydroformylation reactions in this synthesis with very good regioselectively and yield. A stereoselective Prins-reaction then closes the first ring (or should it be named oxa-Alder-ene?). The alcohol was protected as the TIPS ether and the second alkene hydroformylated again with high yield and stereoselectivity giving this odd looking cyclohexane with 5 stereocenters already in place. 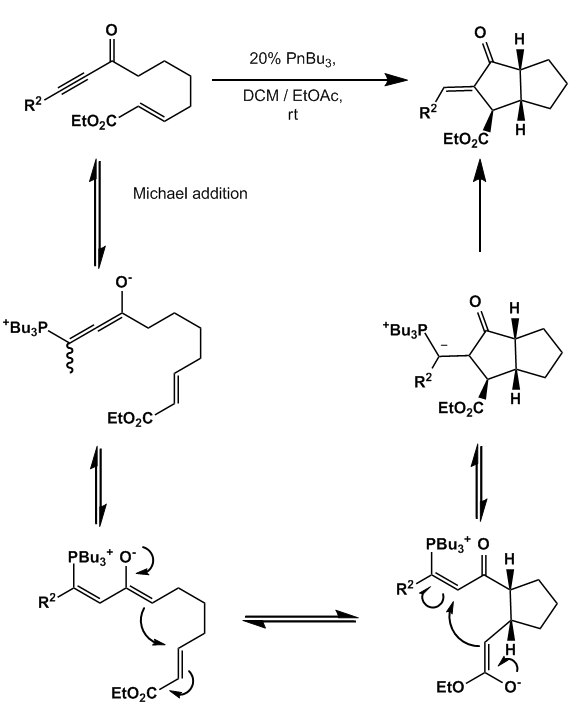 Grignard reaction and protection of the resulting alcohol as the TIPS ether was followed by reductive cleavage of the DPPB group and acetylation of the free alcohol. 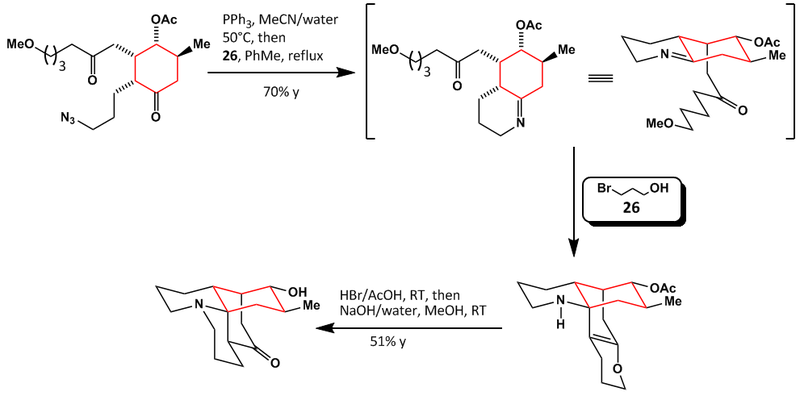 Azide formation under Finkelstein conditions, global TIPS deprotection and DMP oxidation yields a cyclohexanone intermediate ready for some ring closing chemistry. 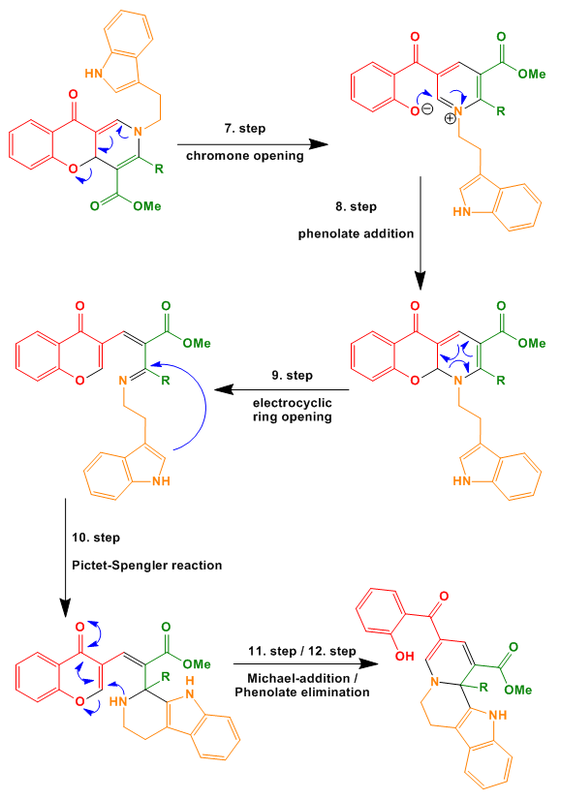 The second ring was closed employing an aza-Wittig reaction resulting in an imine which was directly used to close the third ring by means of a Mannich reaction. The enol ether was opened with HBr in AcOH which results in cyclization and formation of (+)-clavolonine. 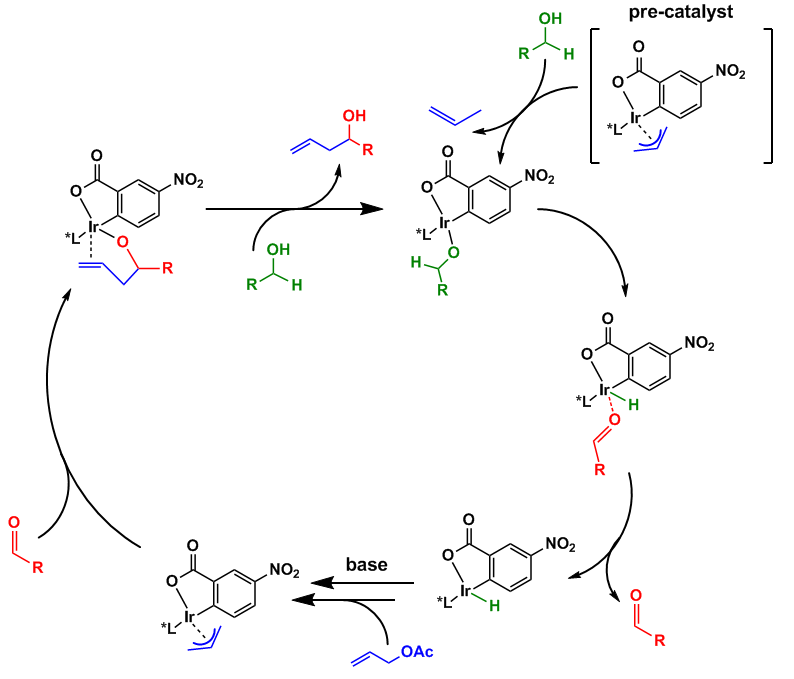 Nice stuff… This hydroformylation looks very promising to me especially in association with this Prins reaction. While reviewing a nice paper from Overman I found this sweet one from Greg Fu and decided to present this to you first. The blue compounds represent the paper from Tomita et al., the red ones the paper featured in this review. 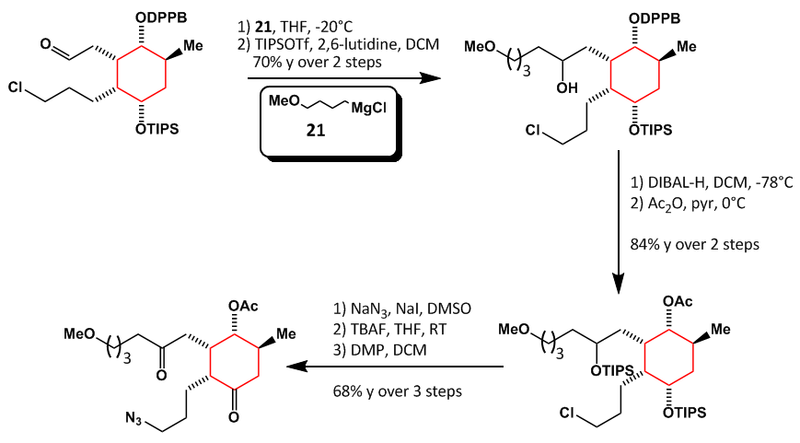 The reaction sequence is induced by the addition of about 20 mol% of tributylphopshine in a DCM/ethyl acetate mixture at room temperature to the starting material. Having established the right reaction conditions the group prepared some derivatives with the yields varying from 54% up to 89% respectively. 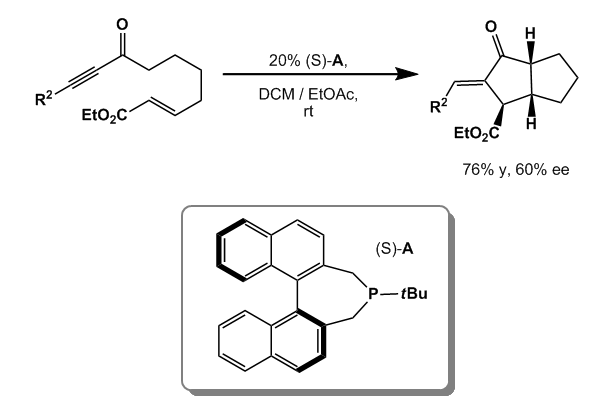 Also the first formed 5 membered ring could be expanded to a 6 membered one without significant loss in yield. 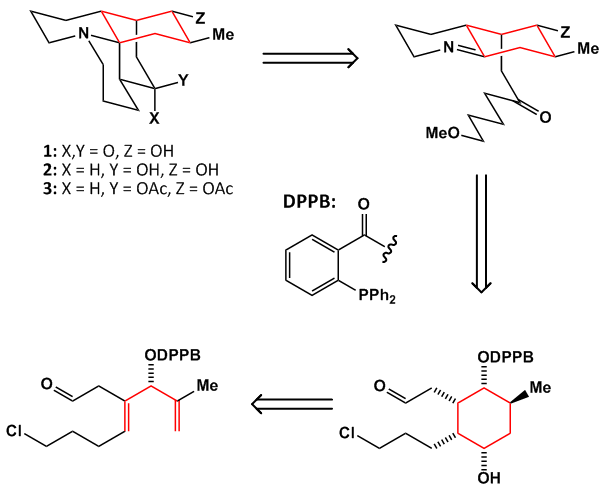 On balance a nice reaction with some potential in natural product synthesis. What do you think? While searching for some new interesting stuff I found this one again in the Angewandte (what a great Journal, isn’t it?). I thought a bit about the conversion of azides by myself and found as the most useful application the Staudinger reaction and the catalytic hydrogenation both to yield amines. But this publication deals with another sort of application. They found that on treatment of azides with a phosphinoester the azide could be high yielding converted into a diazo-compound. The conversion of an azide to a diazo-compund is not new at all but gives almost modest yields and is limited to electron deficient arenes ( doi:10.1016/j.tet.2005.09.145). 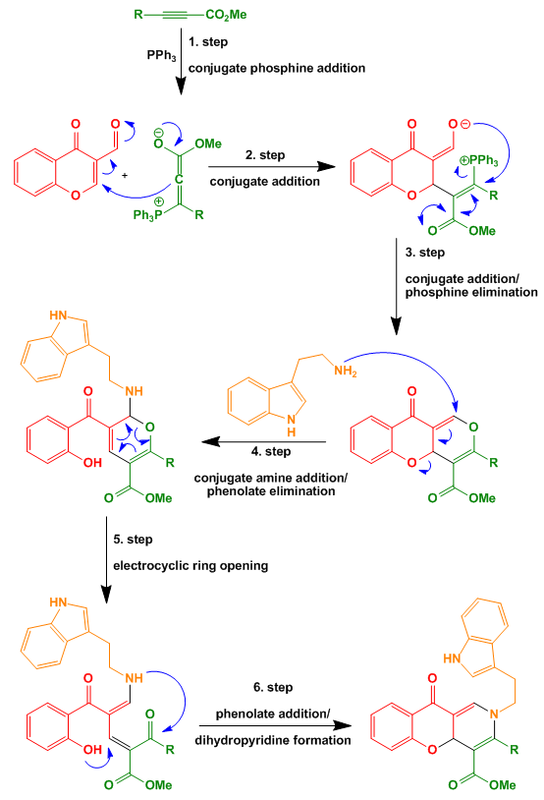 The “normal” way of an azide-phosphine reaction goes through a so called Staudinger-ligation. Herein the azide decomposes through an azido-phosphetane (similar to the oxaphosphetane in a Wittig-reaction) into nitrogen and an amino-compound. But if you combine your phosphine with an “azide trap” you can overcome the decomposition and yield a diazo-compund. The phosphine attacks as usual the electron deficient end of the azide which in turn cyclises to give an acyl-triazeniumphosphonium salt. This intermediate is then hydrolysed to give an acyl triazene which decomposes under warming and after proton exchange give the α-diazocarbonyl-compound. I think it’s an interesting method and a cool application of an old reaction combined with good knowledge of the reaction mechanism.